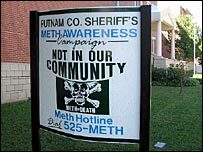 The US authorities have warned that the addictive drug methamphetamine has become a "global threat". US Drug Enforcement Administration (DEA) chief Karen Tandy said global users of methamphetamine outnumbered cocaine and heroin users combined. She was speaking at an international narcotics conference in Canada. Methamphetamine, or crystal meth, is a stimulant which induces euphoria, but can lead to side effects such as violent behaviour and depression. Delegates at the 24th International Drug Enforcement Conference in Montreal were told that synthetic drugs such as ecstasy and methamphetamine were becoming a worldwide phenomenon. "Methamphetamine trafficking and the movement of its precursor chemicals are an increasing global threat," Ms Tandy told the conference. "More than 26 million people worldwide use amphetamines - largely methamphetamines... ," she added. She cited the example of a laboratory in Indonesia, raided in November, which had exports linked to Hong Kong, Thailand, Singapore and the US. Criminal gangs were also exporting the drug from the US to Japan, she said. The raw ingredients of the drug were being shipped from India and China and smuggled through third countries, she added. Dr Paul Thompson, a California-based neuroscientist researching the effects of the drug, told the BBC's World Today programme that the spread of the drug could lead to an increase in violent crime. "We know that many of the people that are arrested in Los Angeles - about 40% of them - have been using methamphetamine," he said. "We're worried that as this drug is spreading throughout the US and overseas, this could produce a massive increase in violent crime."